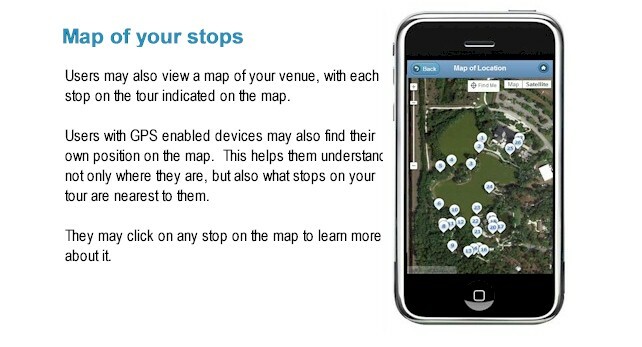 TourOn™ is for museums, gardens, parks, trails, any kind of venue that has stops of interest to it's visitors. 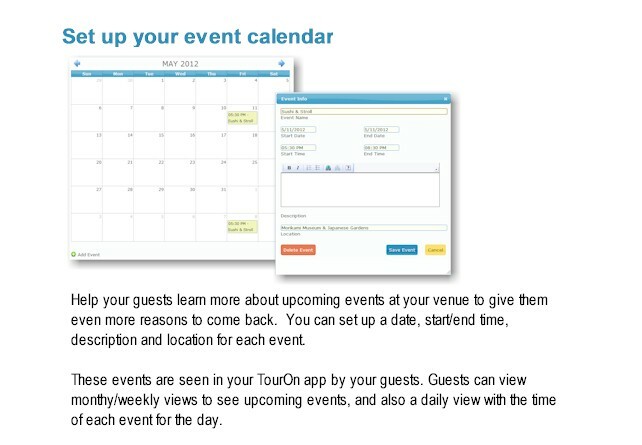 What do I need to know to make a TourOn Mobile Web App? No programming or web design skills are needed. 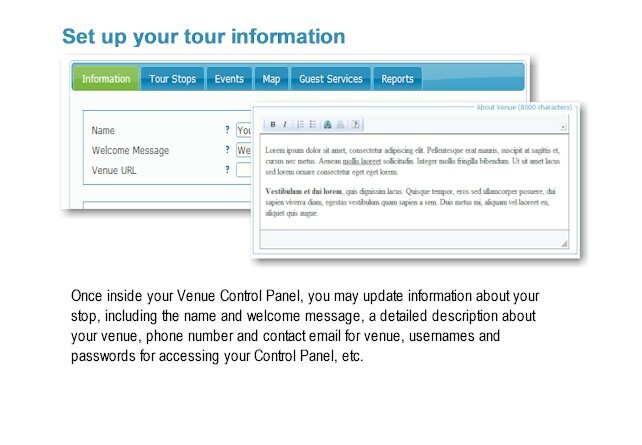 Our TourAdmin Control Panel allows you to easily enter the content for all your tour points of interest. 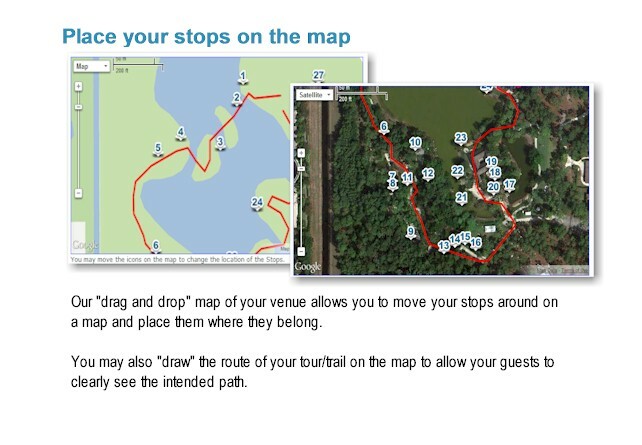 Everything from entering text, uploading photos, and setting the position of your stops on the map is easy and friendly to do. What kind of phones will my Tour App work with? 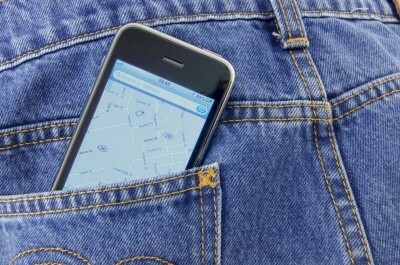 Because it's a "web app", TourOn will work with most smartphones out today. This includes iPhones, Android phones, Blackberry and Windows Mobile. 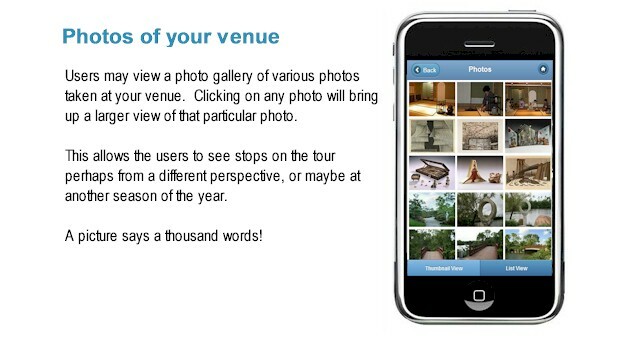 So one app will work for just about every smartphone your guests could show up with! 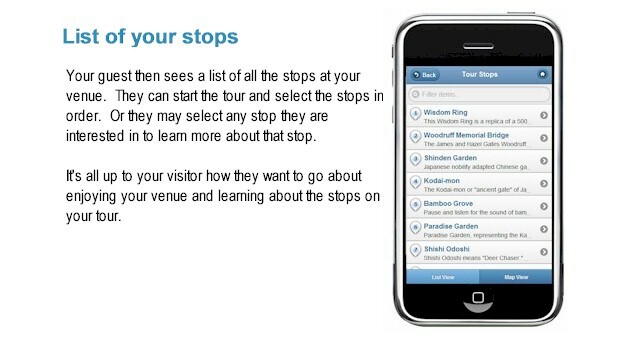 How do my visitors get TourOn on their phones? The easiest way is to use the QR code that we provide on public signage. This QR code can be scanned by all smartphones, and can either start up your TourOn app, or even take them directly to a specific point of interest within your app. How does the pricing of TourOn work? 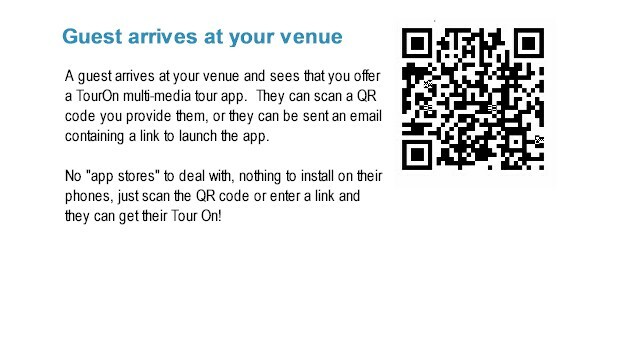 My Marketing Department wants to know if we can find out statistics on users of our Tour App. What statistics can we see? TourOn integrates with Google Analytics, a top tier analytical statistics provider. We will help you set up your Google Analytics account so that you can get access to extremely detailed statitics (where you users are from, what phones they have, what screens in your app they are using, etc). The exhibits at our venue change frequently, can we change the information about our exhibits? Absolutely! 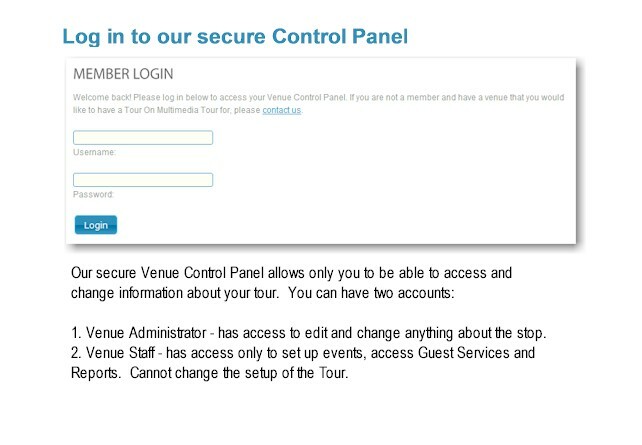 Using the TourAdmin Control Panel, you can make any changes you like, including adding, deleting, or just de-activating any stop in your tour or exhibit in a gallery. 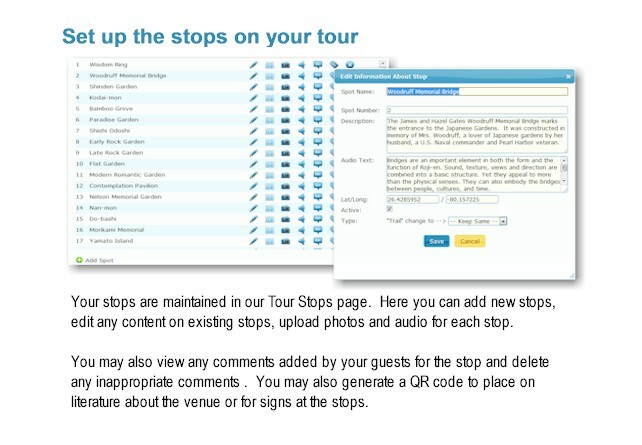 These changes are seen immediately in your Tour. Do my guests need internet access on their phones? 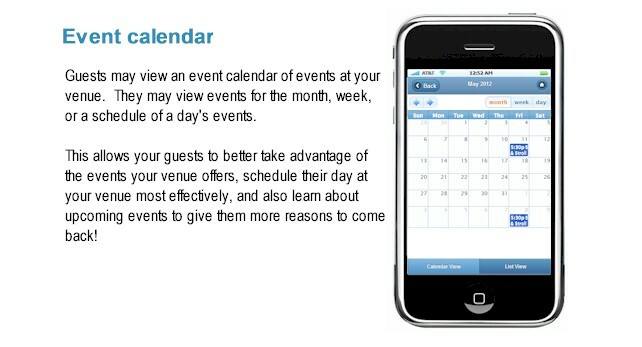 Yes, guests must either be connected to their cell phone providers internet network, or a local WiFi at your venue. This is because the app always gets the latest updates you have made to your app, so it needs an internet connection to do this.